In digital marketing news this week is the arrival of the Google My Business App, making it easier for business owners to manage their online presence and reach new audiences in an easy and convenient way from their mobile phone. Statistics show that there are 4.57 billion mobile phone users worldwide and in the digital age there are more people than ever using their phone for business purposes. This is prime example of why it’s great to see that Google have introduced the Google My Business app to support business owners. Google My Business or GMB as it is also known has many advantages. First and foremost, it is a great way of listing your business so that it appears in the search engine results and on Google’s maps pages. But, more importantly, it’s free! This is definitely something that should be taken advantage by businesses big and small! It’s easy to set up and spending a relatively small amount of time on the set up will allow you to gain a clear advantage over those businesses who have not yet bothered to set up their GMB listing. Any time a user makes a local search on Google such as ‘music venues near me,’ if you have listed your business on GMB and are in the top 3 listings, you will show allowing more customers to find you in the right moment and right time. Once you have set up your Google My Business account, the app provides an easier to use the free business opportunity that Google has presented and you can do many things with the GMB app with it all being at your fingertips. Monitor your engagement levels with full insights into how people are finding you; by searching for your brand itself or customers who are finding you through searching for products or services related to you. You can also find out how many views were generated through the SERP or the maps page. 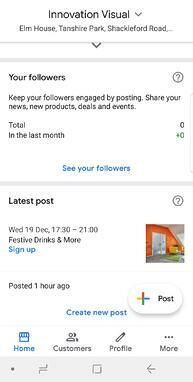 On the app you can easily upload new posts that will display on Google including photos, deals and offers or events that you may have coming up. This is done through the ‘homepage; tab. On the ‘customers’ tab is where you will see all your reviews or followers. Reviews are a great way to receive feedback from your customers and they provide useful information to other consumers who may be considering using your business. Consumers today like to receive immediate responses from companies. 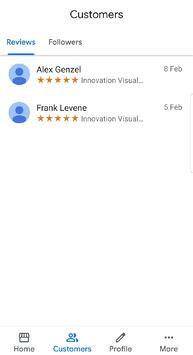 Receive notifications to your mobile phone device when someone reviews your business and you can then respond to a review by simply clicking on it making the process extremely quick. Google have aimed to make the process of using Google My Business easier for business owners by building the app. Setting up Google My Business can be pivotal to your business and is considered a tool that should be utilised by all as a necessity to grow your business profitably. 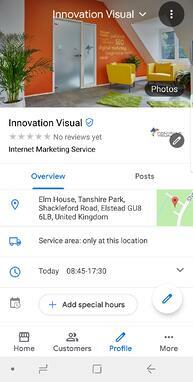 As a leading digital marketing consultancy based in Surrey, Innovation Visual can provide your business with strategic direction to improve your local SEO which include optimising your Google My Business account.